1709 Dedicated bike carriages [Class 153?] for rural Highland lines? Story gains momentum Our hugely popular tweet of the story. 1510 Campaign for flexible space in every carriage See news items 29.10.15 [and factsheet] 4.10.15 8.7.15. 1506 Spokes Bike/Rail public meeting with speakers from Abellio/ScotRail, Sestran, Transform Scotland and Campaign for Borders Rail. On-train bike space was the biggest concern of the 100-strong audience. 1506 Abellio Scotrail Cycle Innovation plan [CIP] full document [pdf 900k] from Transport Scotland website rail franchise pages [see Transport Integration]. ScotRail presentation to Scottish Parliament Cross-Party Cycling Group [pdf]. 1502 Gogar Interchange Station Spokes letter to Transport Minister Derek Mackay (also re Bathgate/Airdrie & Borders rail projects). 1411 Haymarket Bike Parking Sustrans/Council applicn to Stations Fund [link to 6MB pdf]. Spokes letter of support. Sustrans blog. 1410 ScotRail Franchise awarded to Dutch rail company Abellio. Details and documents in our news story 8.10.14. For Franchise process up to now, see 1202 and 1311 below. 1407 Waverley Station bike access ban – see our news story 4.7.14 and The Guardian 10.7.14. 1401 ScotRail Franchise Bidders Spokes letter to the 5 companies bidding for the franchise [pdf 131k] – i.e. our reponse to the ITT (below). See also our 5.1.14 and 29.6.14 news items. Sustrans response to ITT [pdf 191k]. 1311 ScotRail Franchise The Invitation to Tender [ITT] document is out [pdf 4MB]. Our comments [1202 below] may have helped as there is a lot on cycling [p95-100]. Transport Scotland page on the franchise process. 1304 ScotRail – Linlithgow Station Bike Information Board … PDF of Info Board [pdf 1809k]. New edition [see 0909 below for original]. 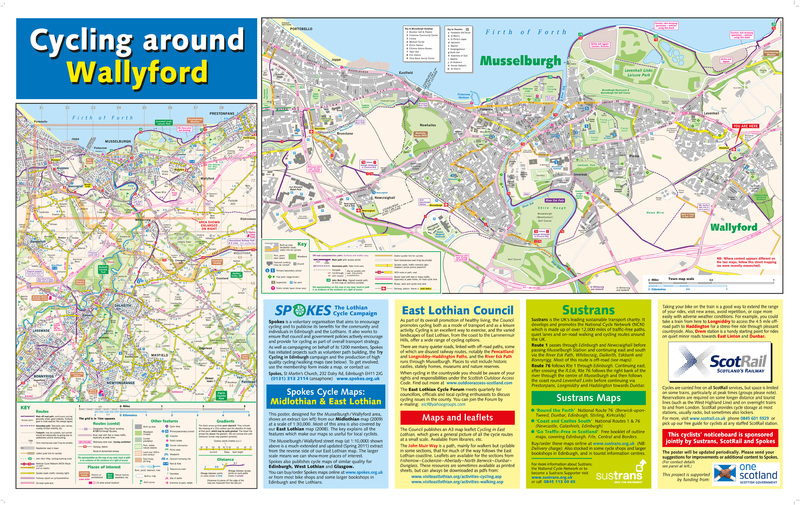 There’s a separate pdf of the town map alone on our West Lothian page. 1303 Borders Rail developments  Sustrans website showing Midlothian & Borders cycleroute changes as work progresses [if you have updates/ corrections/ news for the site, please email dwardropwhite AT yahooDOTcoDOTuk. Our fears and hopes for cycle/rail integration in the Borders Railway, and how you can help. 1111 Edinburgh Glasgow Improvement Project, EGIP – consultation response from Spokes [pdf 23k]. This massive project will electrify the E-G main line, including a new stretch of line, the Alloa/Dunblane spurs, and new rolling stock. We support the principle of the project but are very concerned about bike carriage implications. 1111 Bathgate-Airdrie Rail Reopening – Spokes notes on poor cycle access to stations – plus comments on NCN75 – see 1111 entry on West Lothian page. 1109 East Lothian stations bike posters – Following the example of the Linlithgow board [0909 below] there are now bike noticeboards at Musselburgh [jpg 2.7MB], Prestonpans [jpg 2.7MB] and Wallyford [jpg 2.7MB], sponsored by Sustrans [funding], ScotRail [signboards] and Spokes [expertise]. Picture of Prestonpans board in situ [pdf 303k, Paul Ince], ideal location next to platform entry and bike racks. 1107 North Berwick trains – Spokes letter to East Lothian Courier [doc 29k] re inadequacy of new Class 380 trains for bikes, buggies, luggage etc [see also 1005 North Berwick below]. NB – these trains will appear elsewhere in Scotland – they need fold-up seats in every coach!! 1009 North Berwick trains – survey of bike usage – please use this form when you use the Edinburgh-NB rail service. NB survey form [doc, 32k]. Please download the form, complete it using Word, Open Office, etc, then email it as an attachment to the address in it. [Or print, write and post it if you prefer]. 1009 North Berwick [& Ayrshire] trains bike capacity … Further letter to Transport Minister [pdf 64k] making strong case for political intervention. 1005 North Berwick trains bike capacity … New trains are planned for April 2011 which will reduce dedicated bike capacity from 8 to 2 spaces per train (although one bike will be allowed in each vestible if the train is not too full). For full details [and picture] see this Spokes briefing document [pdf 809k] [updated 19.6.10]. 1005 Britain’s first Station Bike Hub (‘Cyclepoint’) opens in May 2010, thanks to the UK government’s £14m grant for bike hubs at 10 major rail stations. The bike hub includes all-day supervised bike parking, repairs, spares, etc. See the Cyclepoint brochure for full description. The Scottish government is not following this example – see p6 of Spokes Bulletin 106 – please write to your MSP! 0909 ScotRail – Linlithgow Station Bike Information Board … PDF of Info Board [pdf 3299k]. ScotRail’s first cyclist information board – content produced by Spokes at ScotRail’s initiative. 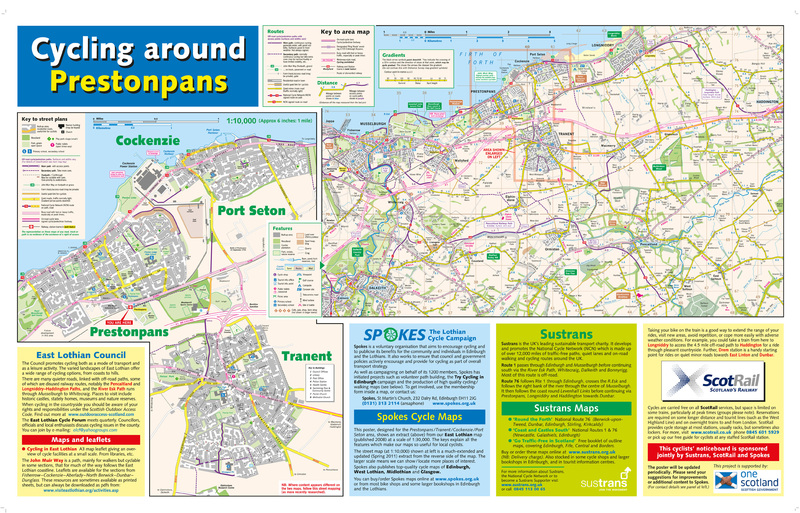 Many thanks to our map designer Tim Smith for putting the pdf together, incorporating updated extracts from Spokes West Lothian map. Opened 11 Sept 2009 by the Convenor of the Scottish Parliament’s Transport, Infrastructure and Climate Change Committee, Patrick Harvie MSP [picture of opening in Spokes Bulletin 105]. We can update the content up to twice a year, so comments are welcomed. We hope similar boards will appear at other appropriate stations. Spring 2010 update – Similar boards are being developed jointly by Spokes, Sustrans, ScotRail and East Lothian Council for various E Lothian stations.